Put mohair in the freezer before knitting up, it stops it shedding so much. If going to machine knit some hairy yarn, place it in a large plastic bag and spray in some silicone knitting spray and leave for a day. It will run better through the sinker plate. Invest in a wool winder. Re-wind yarn into a neat (flat bottomed) ball and pull yarn from the middle. Ball will not jump about, much easier to knit with. Have a look at cross stitch charts for ideas for filet crochet. Other uses for recycling denim are skirts, purses, jean jackets (use those Big Bel/raver pants and a pattern), organizer covers and even sandals. Cut heel and sole out of wood then use the jeans to make the part over the bridge of the foot and straps. Cute if not very practical in harsh conditions! Use old jeans for quilt and pillow pieces, even the pockets. Pockets can be sewn onto the squares at odd angles. Thanks to Mary Thayer for this suggestion. When handknitting a garment if you knit sleeves from shoulder to cuff (by reversing the pattern) this will enable the sleeves to be lengthened if required. The cast off stitches at the cuff can be taken undone, stitches picked up on a needle and extra length added with either the same or matching yarn. When hand knitted socks wear out pull a thread* from around the ankle area and re-knit foot. This is done by cutting the yarn and then unravelling the stitches this leaves stitches which can be picked up on a knitting needle in order for the knitting to be redone. 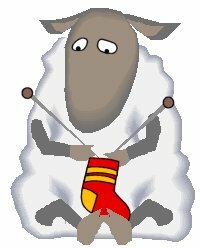 Hand knitted socks can be made into fingerless gloves by cutting at the ankle, oversewing the cut edge to prevent the knitting unravelling, then joining the two edges between each finger to make holes for each finger and thumb. To lengthen dresses, unpick stitching at the waist, knit two rectangular sections in a matching or contrasting yarn, large enough to fit between the two side seams and deep enough to lengthen dress to required length (up to a maximum of about 6"). Then sew the knitted pieces between the skirt top and dress top. If a rib pattern is used for the knitted section this will hold nicely into the waistline. Alternatively, cut across the skirt (a little way up from the hem) and insert a strip of matching or contrasting material which is wide enough to lengthen the skirt to the required length, then join back together. As long as the rest of the garment fits O.K. another strip can be added above the first (i.e. higher up the skirt) at a later stage. To make your own cross stitch or tapestry charts, choose an appropriate picture and put this over some graph paper with carbon paper in between, staple together along the top edge. Trace the outlines, including places where it changes colour, you can lift the image and carbon paper to see what it looks like. When this is done, outline the picture parts to its closest square, then add the colours with coloured pencils or use a different code for each colour making sure you can still see each square underneath the pattern or colour. Choose yarns to match as closely as possible, making modifications as and when required. Now start stitching (if you have time that is). To lengthen or just for variety, sew a piece of heavy fabric with a crazy design (i.e. flowers etc.) on the bottom, giving it a 2" - 4" 'facelift'. Sounds 70'ish but I just saw someone wearing a pair that were actually bought this way - I guess this is coming back into fashion in 2000. When using pins, do not put them in your mouth as this is not only very dangerous but can also mark fabric. Sew a pin cushion onto an elasticated wrist band and use that. If you need to remove a pencil mark from embroidery (or indeed from any fabric), take a small piece of dough from a loaf of white bread, knead with fingers and then rub gently over the pencil mark, which should disappear. To prevent embroidery thread becoming tangled in the skein, remove wrapper, and plait (or braid) the threads. Threads can be removed by pulling from bottom without becoming tangled. Always use thread the same way as it comes off the spool - if used the wrong way it snags. When machining beaded fabric, first hit the seam line with a hammer which will crush the beads without them unravelling, this can then be machined in the normal fashion. 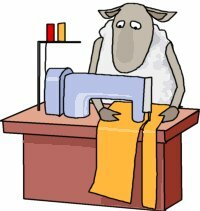 When stitching stretch fabrics on a sewing machine always use the "zig-zag" stitch, this will then stretch with the material and not break. Put clear nail varnish on ribbon ends to keep them neat and prevent them from fraying. To change the colour of shoes, handbags etc. use artists' acrylic paint. These can be used to change the colour completely or, alternatively, to add a design. When removing buttons from clothing, place a comb between the button and the fabric before snipping the threads. This will prevent any damage to the material. Long trousers for boys – when they grow out of them they can be cut down and turned into short trousers. Shirt cuffs- when they become worn they can be turned inside out – and then re stitched. They then look like new!